Sharing delicious and hearty Hakka Cuisine with like-minded cooks and gourmets. 1 kg of glutinous rice (soak for 1/2 hour) & washed. Using rice cooker to steam the rice is easier. Or use a bamboo rack over boiling water in a covered pot. Rice must be completely cooled before putting into clay, ceramic or porcelain urn. Alternately layer rice, yeast, and repeat till ingredients are fully utilised. Sprinkle red sorghum on top. Cover with clean white cloth. Keep in cool dark place. Do not open for the first two weeks. Note : everything from the wash basin, rice cooker, porcelain jar, sieve, cloth, ladle, cabinet, floor, worktop, hands, etc have to be absolutely clean. Otherwise, mould will grow instead and the mixture does not ferment into wine. After 30 days, sieve and filter rice wine and keep in a bottle (no plastics please!). The residue (jiu zao) can be used for cooking prawns or meat. 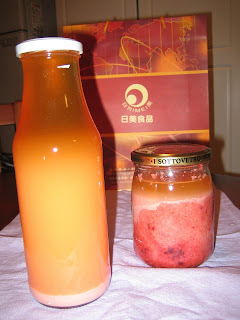 The Fuzhou version contains more wine yeast and more red sorghum. It therefore takes a longer time to ferment compared to It's good for stir fry dishes whereas Hakka wine tastes excellent when cooking chicken wine (gai jiu). Caution : go easy for those with high blood pressure and strong "yang". Safer to take in on rainy days or in winter and of course for post-natal confinement ladies. My friend M asked me why the wine she made based on a Fuzhou rice wine making recipe tasted sour. Answer : there's probably nothing wrong with the recipe. According to my true blue Fuzhou friends, good quality wine must be added to the rice and yeast. Wine that has been left to ferment for too long or exposed to air (possibly due to constant checking of the wine making in progress) may have contributed to the wine turning acidic. Rice vinegar is made by lengthening the fermentation process.